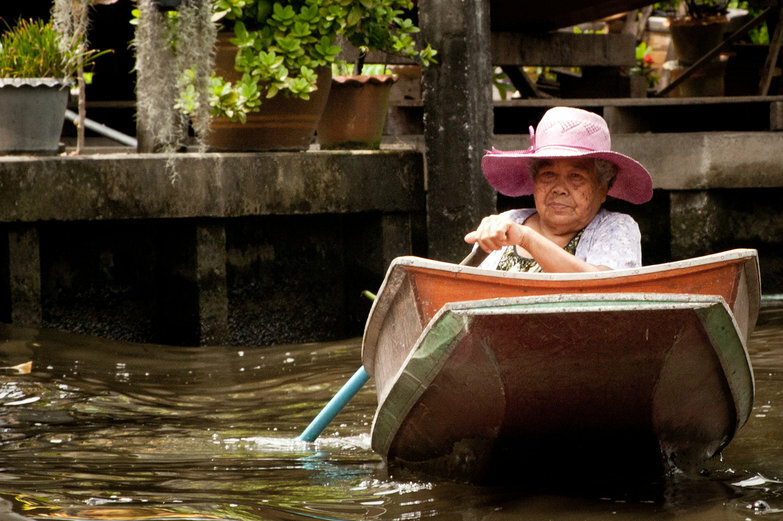 At our friend Neisha's suggestion, we've booked a trip on the rivers and canals around Bangkok. Normally, our guide leads twenty or more people on this tour, but for reasons unknown, we are the only people with a booking for this particular run. As we pull out of Oriental Pier with an entire boat and guide to ourselves, we couldn't be happier about this arrangement. 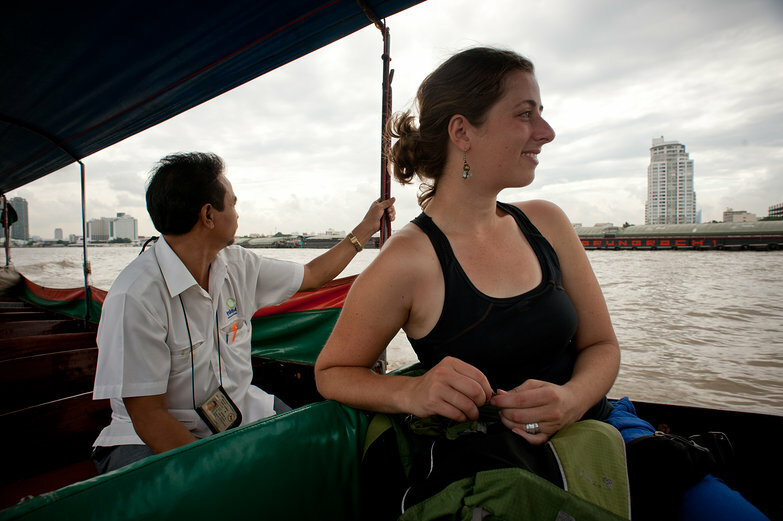 The tour begins with our long-tail boat dipping and rising rhythmically on the Chao Phraya's choppy waters. Our guide, Jimmy, points out fancy hotels and luxury apartments along the highly-developed parts of the river. 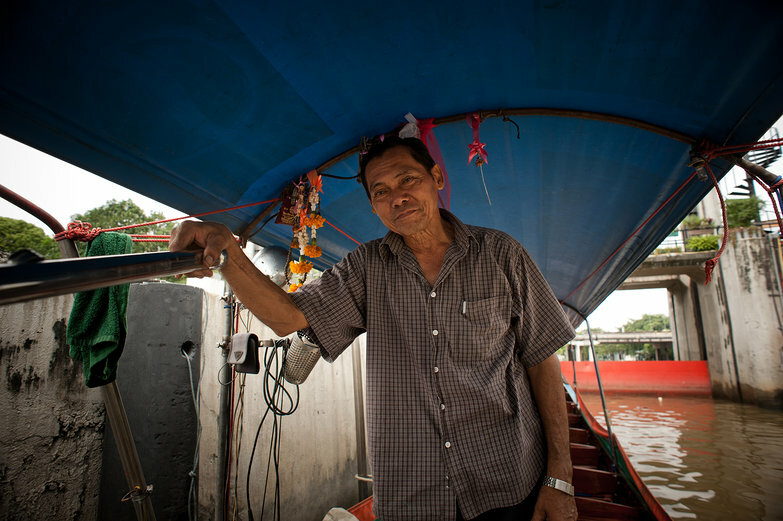 In the back of the boat, our ferryman is steering the vessel towards a nearby loch. 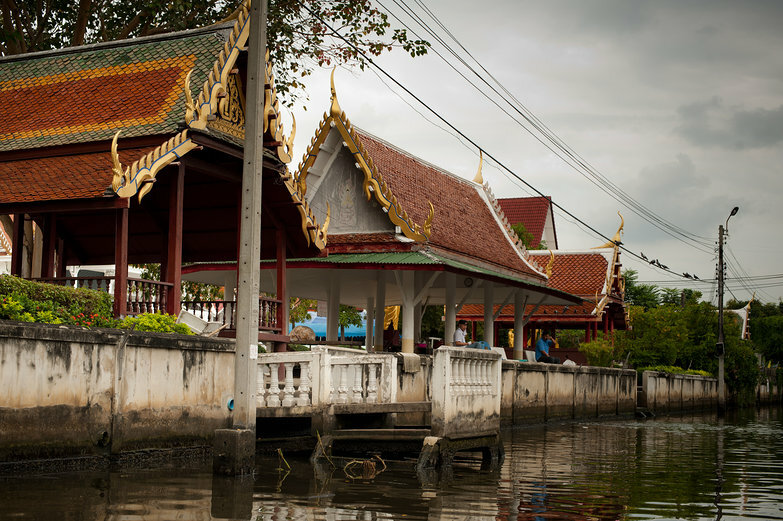 Our time on the wide river is quickly over; the bulk of our tour will take place on the narrower klongs (canals) and waterways around the city. Before we can begin, we must wait several minutes for the water level in the loch to equalize with us. As the lumbering concrete barrier ascends, a new world is revealed. Waiting behind the mammoth gate is a living memory of Bangkok's history, largely inaccessible by any transport other than the one we're in. 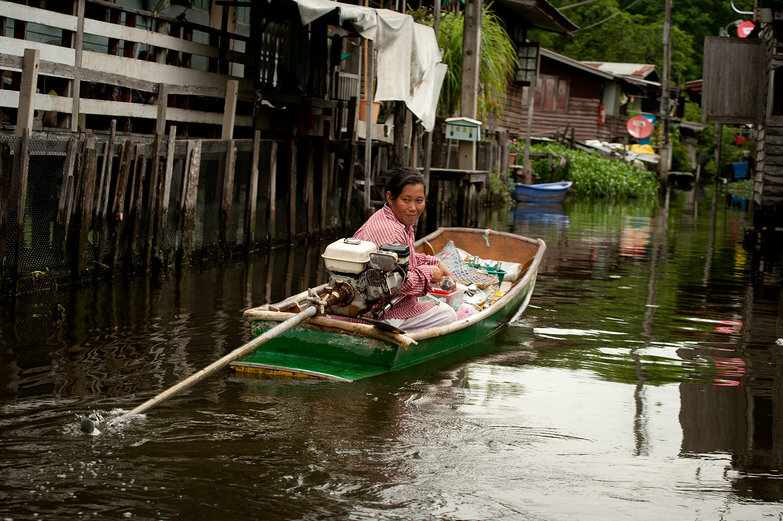 Houses wade knee-deep in water on their spindly stilt legs, and people travel to and fro, running errands in hand-carved wooden vessels; just daily life on the klong. 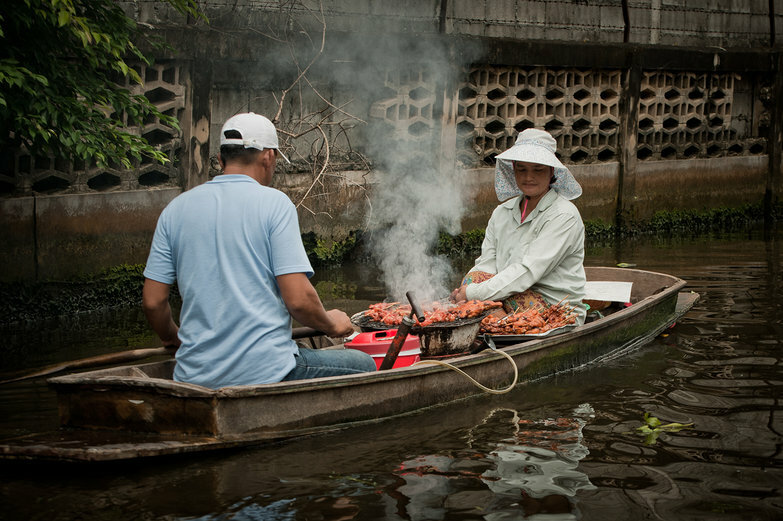 I was first confused when I saw steam pouring from an silently approaching boat, but now I'm floored when I realize it's a floating food hawker with a stove! Any doubt I've harbored about the assertion that there is food everywhere in Thailand has been dashed. I am in love with this country. The first stop on our tour is a canal-side snake farm. Stepping off the tippy boat, over to a wooden dock, we visit the entrance, only to discover we'll have to buy tickets. We've already paid a small mint for the tour, so we skip out on the stop. Our tour isn't without reptilian sightings though! 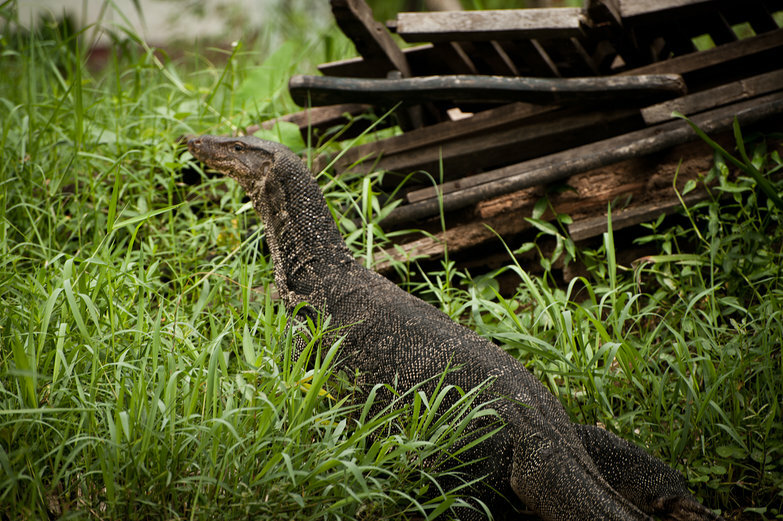 I snagged this photograph of a wild, monster-like water monitor on our way in. Instead of visiting the snake farm, we relax on a bench by the water, and get ice cream from a hawker who paddles up to shore to see if we'd like anything! When we agree to his offer, he scoops round balls of coconut flavored ice cream into paper cups and ferries them up to us with a homemade basket-on-a-stick contraption. Have I said I loved Thailand yet? 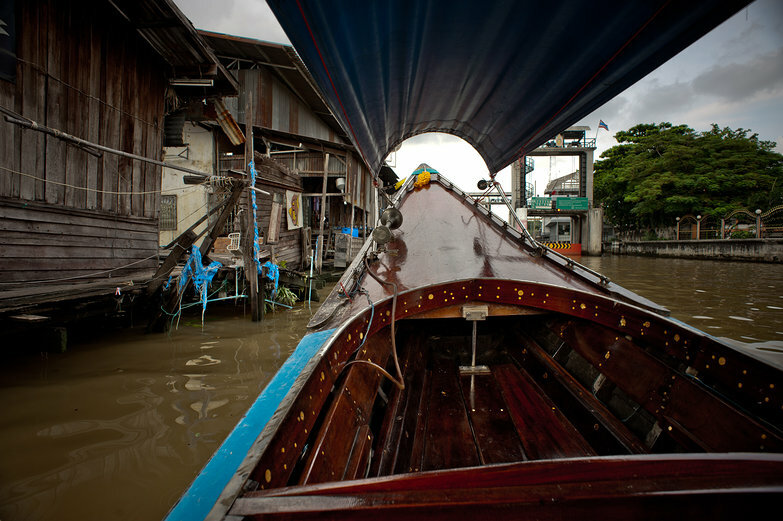 Next up, our boat takes a turn, sending us through the narrowest klong we've seen yet. On either side, palm trees, banana trees, and a host of completely new flora and fauna encroach on the canal. 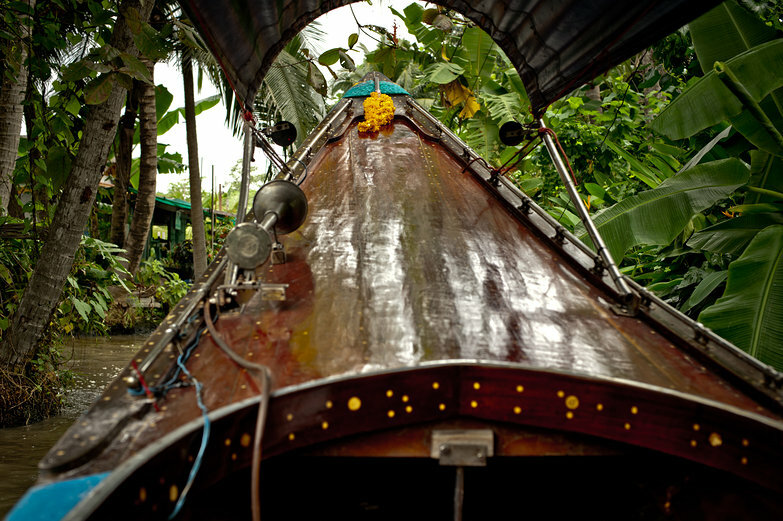 Next, in the middle of our jungle-like surroundings, the ferryman pulls up beside a wooden building decorated with several potted orchids. 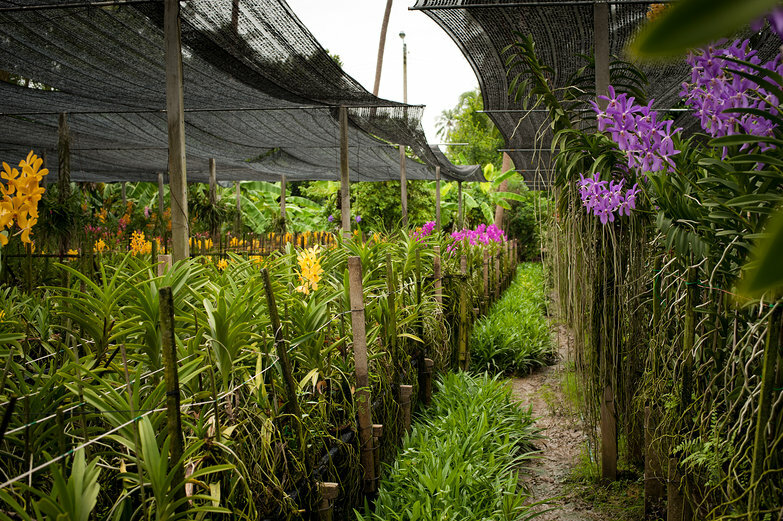 We're here, at the orchid plantation! Jimmy lends me a steady hand as I high step from our swaying boat onto a damp wooden platform in front of a small, dilapidated office. Orchids are growing on an outdoor shelf, while a rusty radio emits a scratchy soundtrack for our visit. 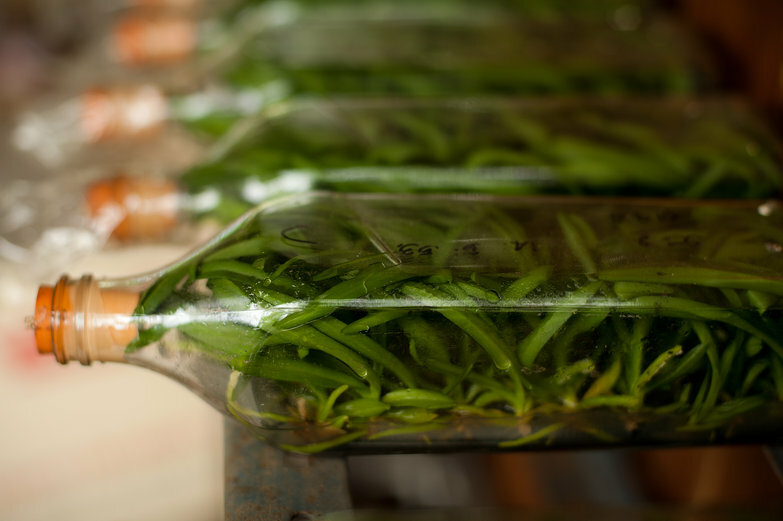 Next to the radio is a row of glass bottles full of plants. 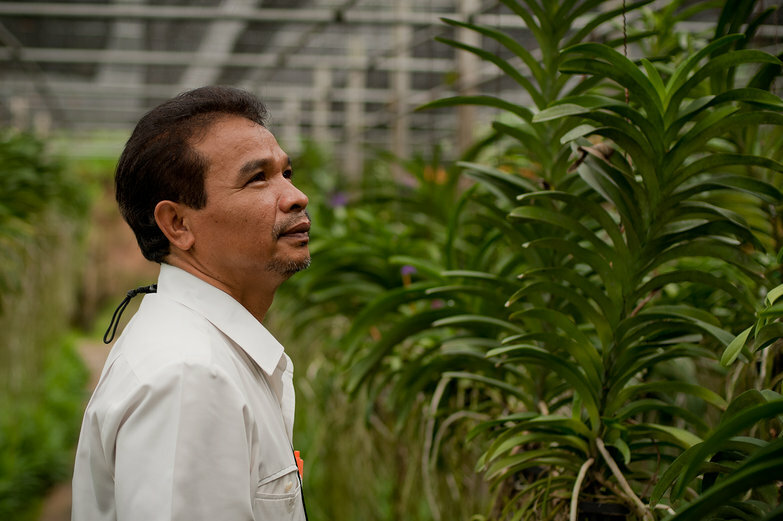 Jimmy explains that baby orchids are growing inside under very special care. 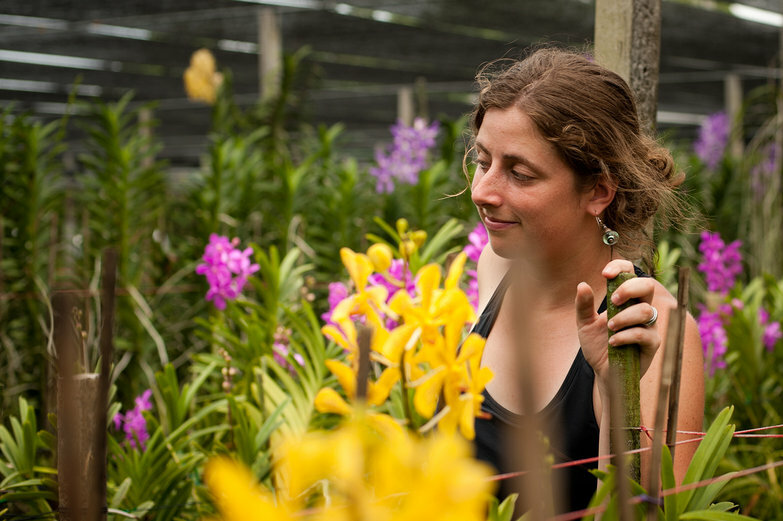 Stepping into the orchid farm, I am surrounded by heady, steaming life. Everywhere I look, there is something green and growing, sprawled out with leafy tendrils, dripping and heavy with moisture. Life here is burgeoning, but at the same time it feels a little foreboding. Though this area is currently flourishing, I have a sense that it could easily slip into the cloying over-ripeness of decay. That, or the plants could swallow this place alive, strangling it with their persistence, restoring the area to the wilderness it once was. For the moment, nature is finely tamed – the plants are at their peak, full and flowering. 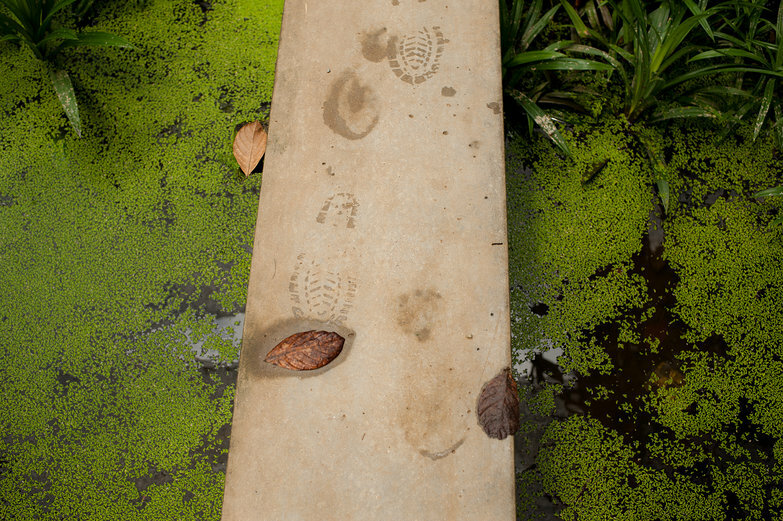 Soon, we're walking on rickety planks over swampy ground, and stepping gingerly over rows of mud. ..and then I am in my own personal heaven, surrounded by flowers. 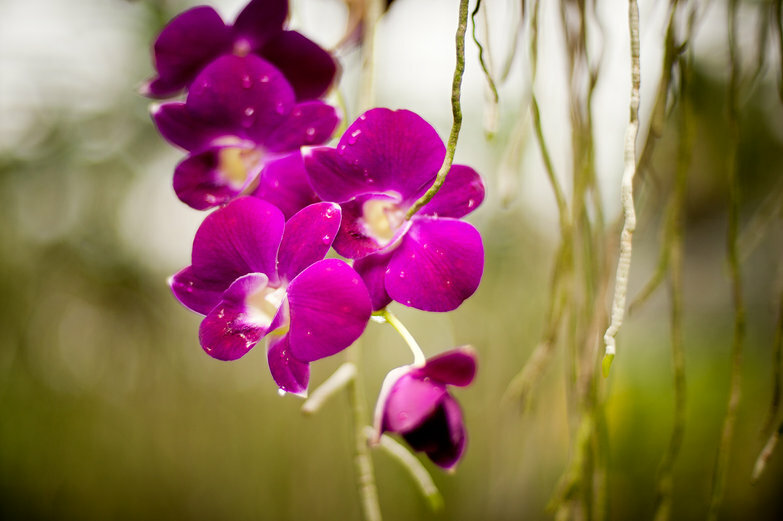 There are orchids of all shapes and sizes and colors, hanging from wooden beams, their white roots exposed. 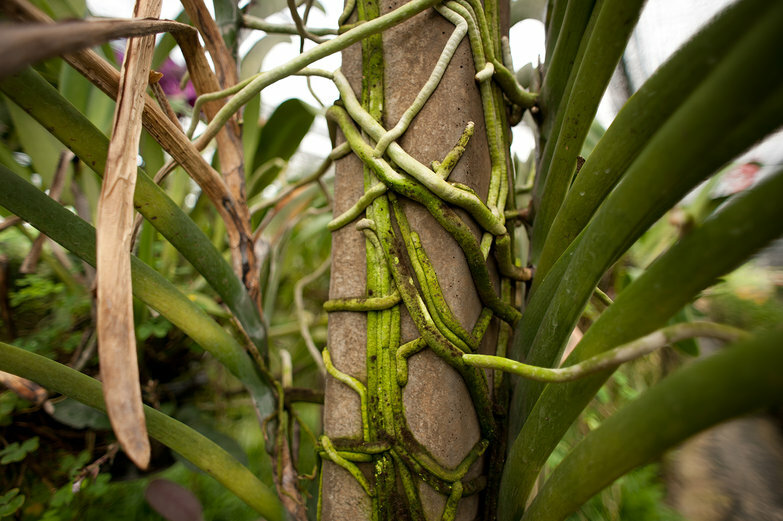 Some smell sweetly of vanilla, while others dazzle with appearance alone. 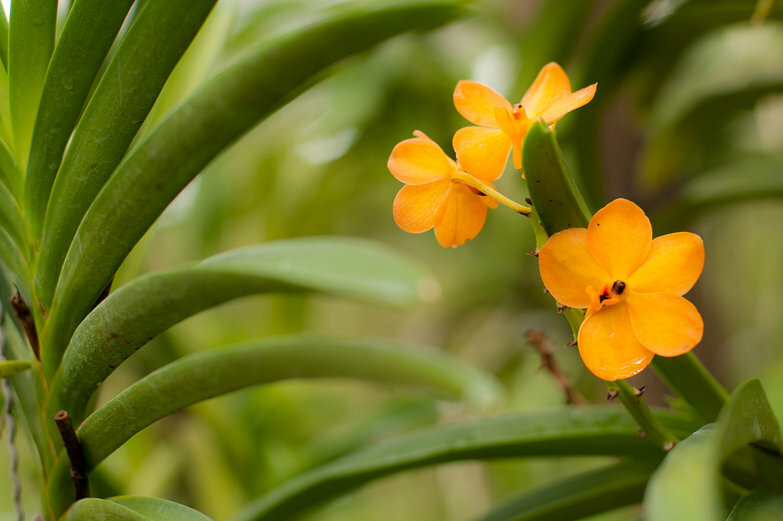 Orchids always seemed like finicky, high-maintenance flowers to me, but here, they appear to be flourishing without too much effort on the part of their cultivators. 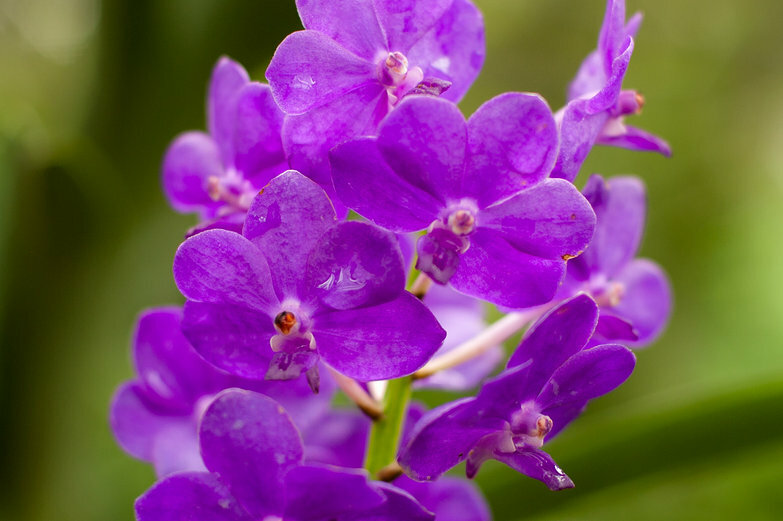 They must be suited to the heat and humidity of Thailand, because the blooms are numerous and exquisitely beautiful. Jimmy seems to enjoy the flowers as much as I do, and delights in telling us as much as possible about them. 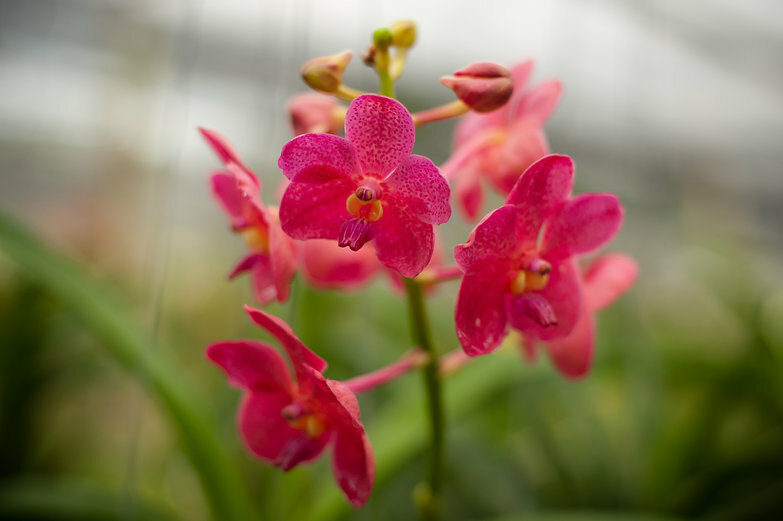 I decide I want to have a greenhouse full of orchids someday. Though he looks stern in this photo, he is a sweet man who reminds me a little of my dear friend, Marcelo. 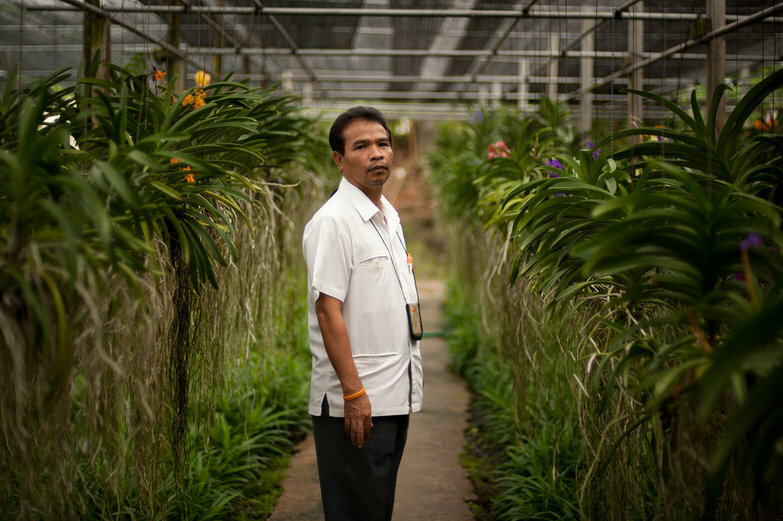 After our informal tour of the orchid farm is complete, Jimmy leads us towards a palm tree and a banana tree, and shows us how people here use them in their daily lives. 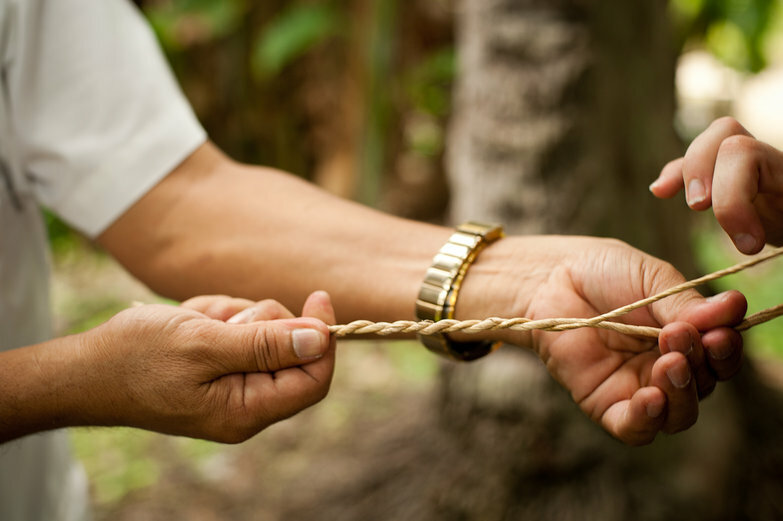 Plucking a long piece from a brown palm frond, he twirls it with his fingers, creating a small rope. I help him out, holding the other end, twisting in the opposite direction. 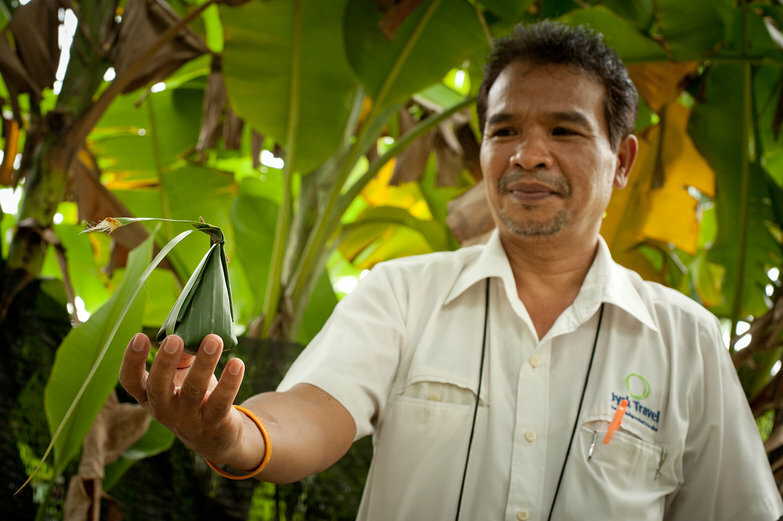 When the leaf is wound tight enough, he doubles it over, and we twist the two ends together. He ties a knot on one end, slices the ends off with the help of Tyler's pocketknife, and wraps it around my wrist as the perfect souvenir. Then, he takes a banana leave and tears it into a square. This he folds up, making a container for rice or other foods. 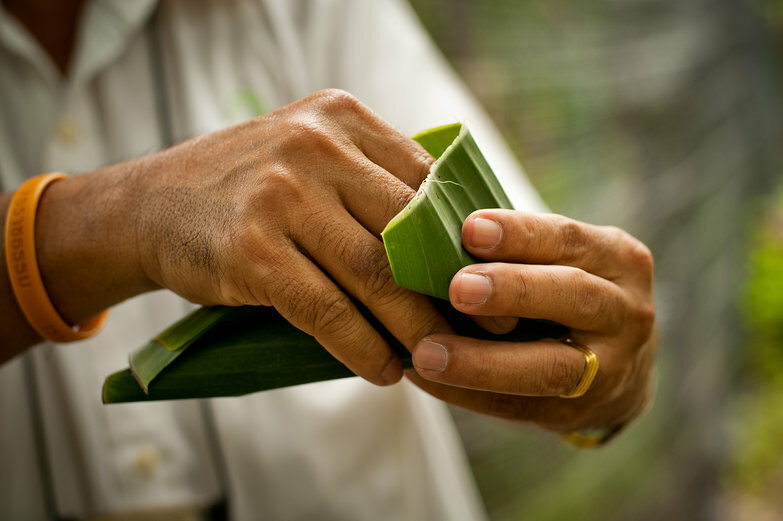 He explains that banana leaves make really good plates! 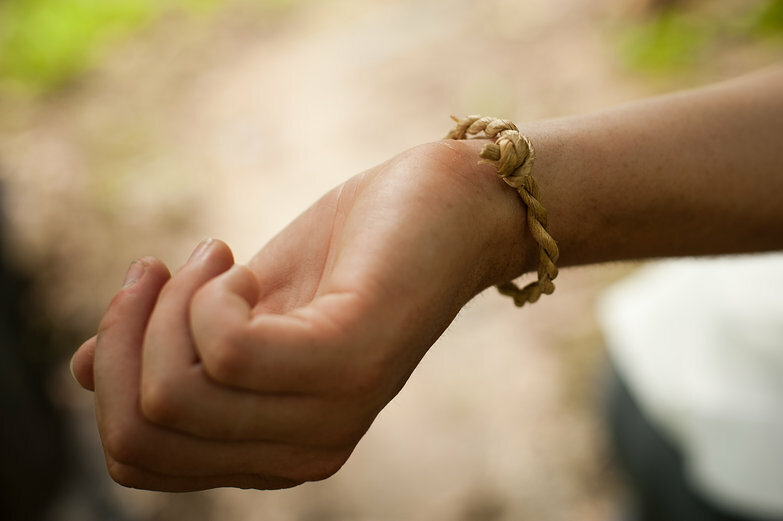 With the help of the sharp vein of a palm frond, and the same long leaf he used to make my bracelet, Jimmy completes the small package and then gives it to Tyler. 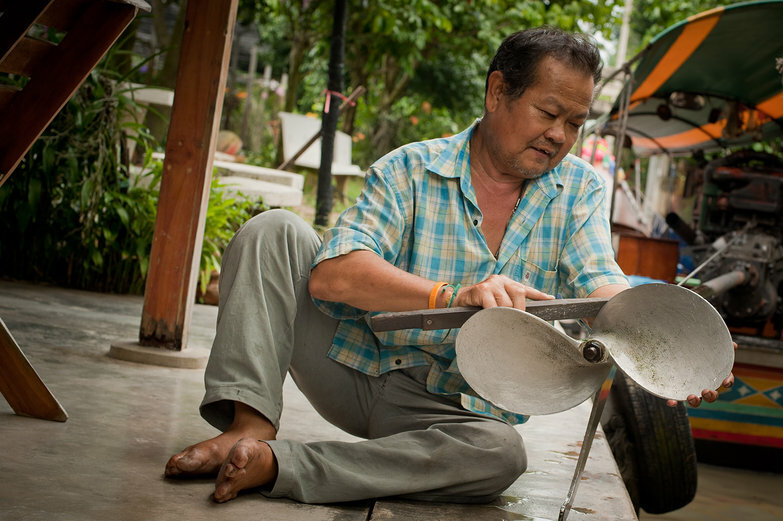 Right before returning to our boat, we stop for a minute to watch this man at work, sharpening his propeller. 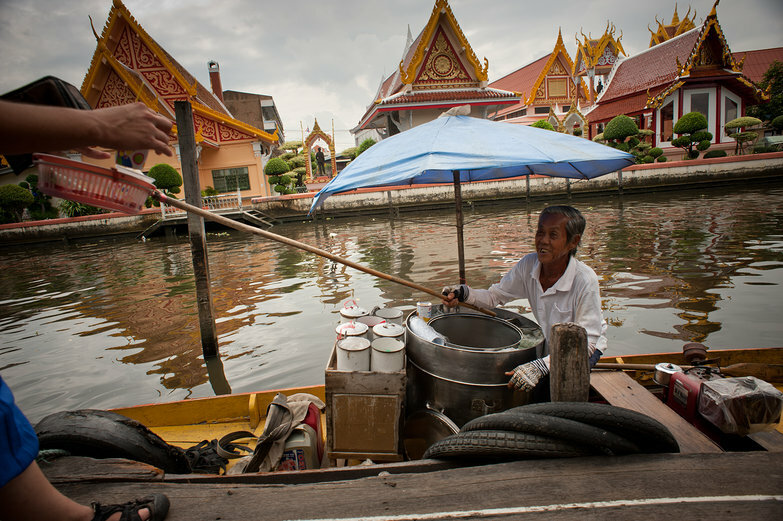 The final stop on our tour is a watery wat, where we will serve lunch to a school of hungry fish. 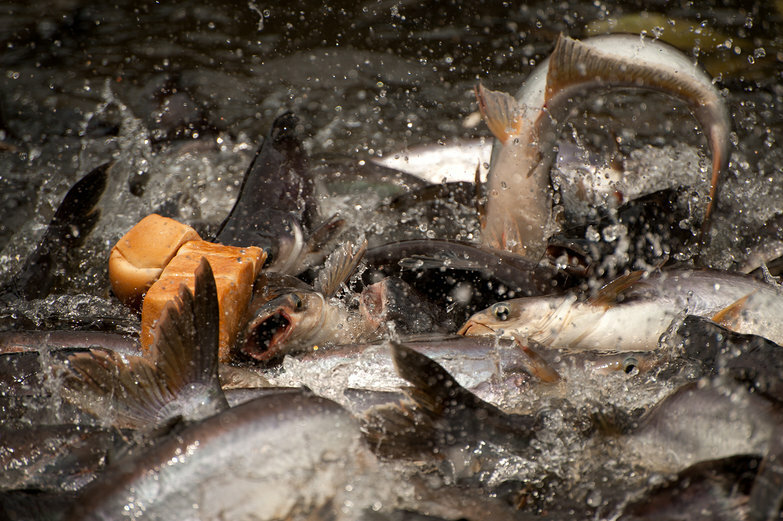 Apparently, around temples, it is frowned upon to kill animals – fishing is a definite no-no. Instead, feeding them is encouraged. Our boat pulls over and Jimmy hops out to buy bread for us. There is a woman nearby who bakes it specifically for this purpose! We are really, really hungry by now, so we sneak some of the bread for ourselves before tossing the rest in for the fish. Unexpectedly, they go INSANE. 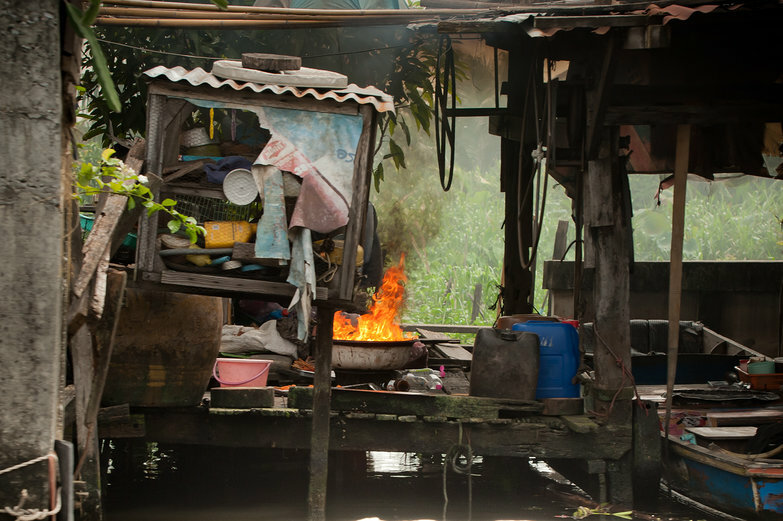 The klong is suddenly a writhing, flapping pit of ugly, desperate fish with round, toothless mouths opening and closing, their crazy, possessed eyes all bugged out of their faces. Water splashes everywhere. …and, with that shocking scene, our tour comes to a end. Well worth the price of admission! The St. Cloud area allegedly got 9" of snow yesterday (most of it melted on impact, but still...)! Reading this journal entry is like taking a trip to the Como Zoo Conservatory on a wintry day. Thank you, guys. Ahh. I have missed Tara's flower hour! Glad to see it making a comeback! Retraction: We did not get 9" of snow. My eyes deceived me. But your orchid tour was wonderful anyway. 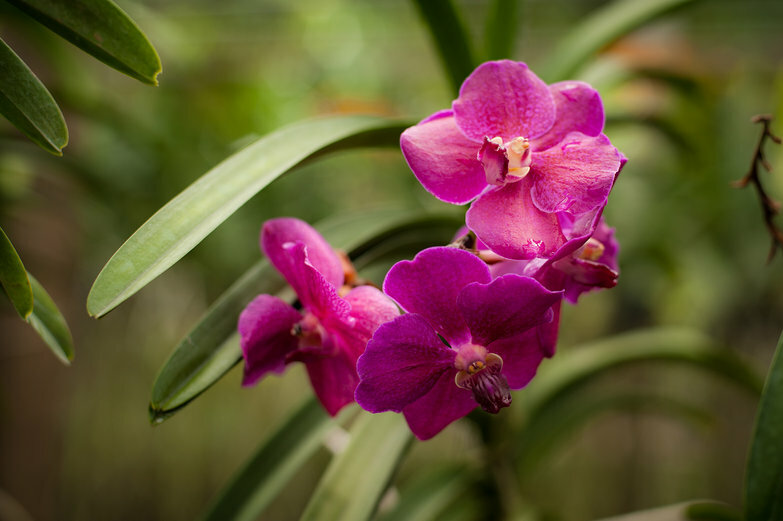 Mary - Glad our little glimpse of sweltering Thailand is brightening your Minnesota winter! Now I got one more reason to plan a Bangkok itinerary. 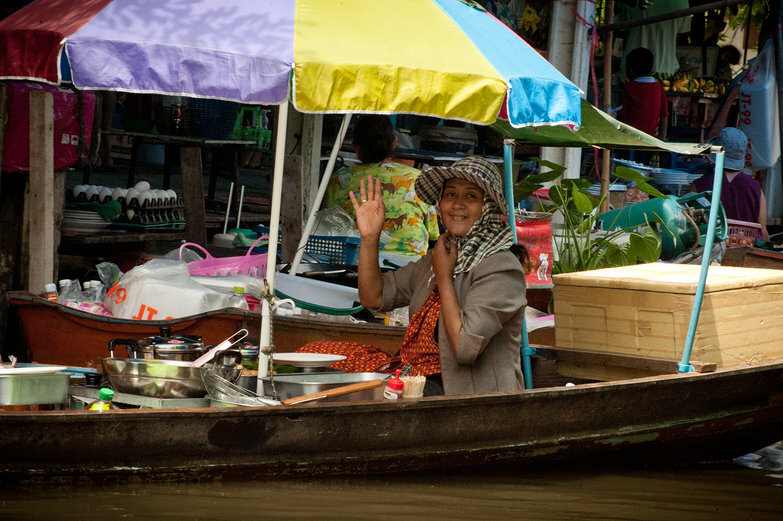 I will definitely enjoy boat ride in Bangkok along with floating markets, nightlife, shopping temples etc. . .